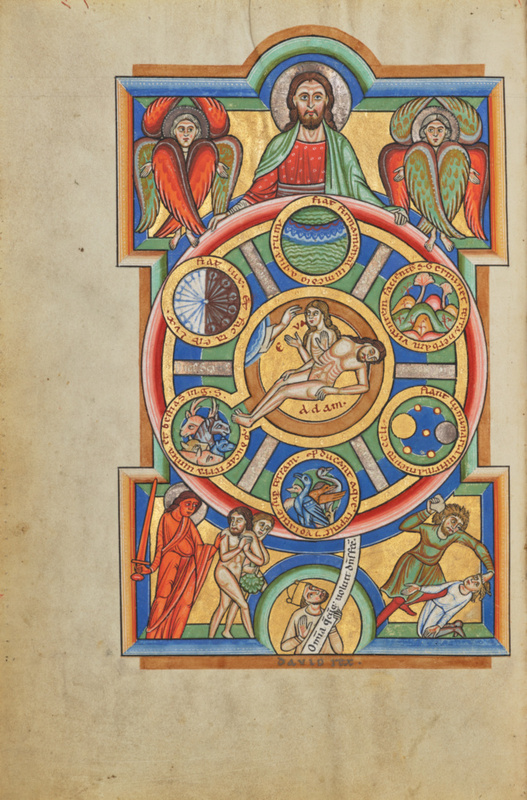 In this miniature of the Creation of the World, the Creator, flanked by seraphim, holds a disc with roundels representing the six days of creation between the spokes. Inscriptions from Genesis describe the events of each day, beginning in the upper left quadrant with Fiat lux et facta est lux (Let light be made and light was made). Read clockwise, the cycle moves around the disc to God's creation of the animals. The artist links this roundel by an open channel to the center of the disc, where the creation of Eve is shown. In the lower left corner of the miniature, an angel pushes Adam and Eve from the Garden of Eden, while on the right Cain kills Abel. At the bottom center, King David holds a scroll with a verse from Psalm 134: Om[n]ia q[ue]cu[m]q[ue] voluit d[omi] n[u]s fec[it] (All that pleased the Lord, he did). This first miniature of the Stammheim Missal creates a transition between the calendar of Church holidays with which the manuscript opens and the text of the Mass that follows. The artist used deep colors and abundant gold and silver leaf, organizing the various scenes with geometry for clarity.